Kangaroos are one of Australia’s biggest tourist draws, but visitors to one park are getting more than they bargained for. Carrots in hand, the tourists approach the kangaroos, seeking a selfie. It doesn’t always end well. 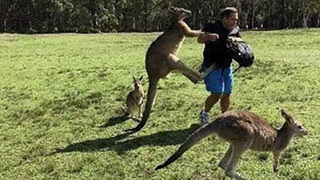 A photo posted by a tour operator on Facebook shows a kangaroo leaping up to kick a tourist with its powerful legs. Other photos show a woman with a scratched face and a man with a bloody gouge in his stomach. 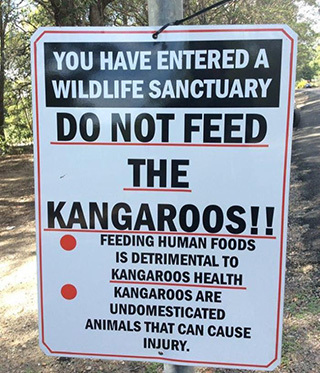 “Kangaroos can occasionally be aggressive no matter what the circumstances are, but 90% of the time it’s the people who are trying to feed them who are attacked,” Shane Lewis, who operates a tourist shuttle service to the park, told Reuters. A kangaroo’s natural diet is mostly grass, so the sugar in carrots can make it hard to effectively absorb nutrients and lead to a “slow and painful death,” she added.